St. Luke’s Care and Healing Ministries are comprised of a number of different groups, all of which share the common goal of ministering in Christ to those in our St. Luke’s congregation in need of meals, rides to church, prayer — both long-term and immediate — and the Holy Eucharist when homebound. In addition to the deacons and priest visiting shut-ins, several lay ministers make visits and provide monthly communion. Through phone calls and notes, lay ministers help shut-ins stay in touch with the St. Luke’s community. 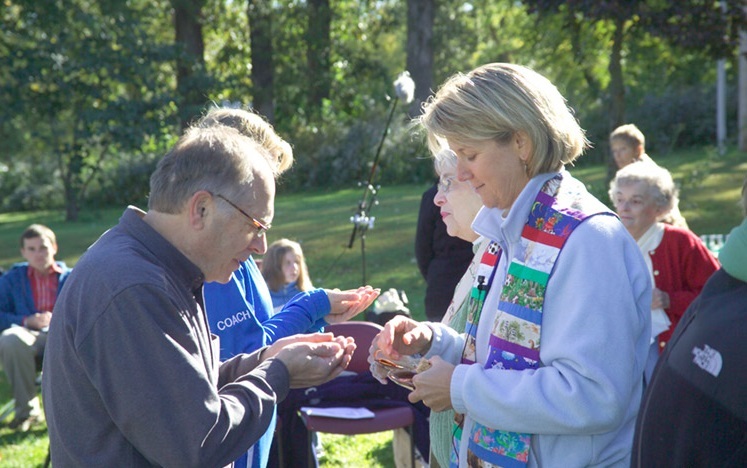 A growing ministry at St. Luke’s is the regular offering of healing prayer. The pastoral care team and prayer circle members offer a monthly healing service in the chapel. Prayer teams also offer healing prayers in the healing alcove outside the nave during Sunday communion. We have an active Prayer Circle with approximately 45 church members who receive prayer requests. The prayer requests are also relayed to the Healing Service team for that monthly service. Each Advent and Lent, our Labyrinth Committee invites the Cedar Falls/Waterloo community to walk St. Luke’s labyrinth, a 36-foot indoor canvas patterned after the one in Notre Dame de Chartres Cathedral in France. Through newspaper articles, mailings, and word of mouth, we invite the public to come and join us in walking the labyrinth. This important time of silence and thoughtful walking meditation connects all faiths.